It is rewarding to have six of the above volunteers named. They may have been some of the first ‘lads’ from Mansfield to join the RAMC [Royal Army Medical Corp] and serve with the British Expeditionary Force. Jim [James] Lee was a coal Miner Deputy living with his parents William and Martha Lee, at 4 Rock Bank House, Mansfield in 1911. In 1914 when he enlisted they lived at Sherwood House, Little Barn Lane, Mansfield. He recorded much of his life with the RAMC [Royal Army Medical Corp] in diaries, some of these have been deposited in the Imperial War Museum, others are with his family. After the war he continued to work At Mansfield Colliery. Jabez Webster born at Pleasley Notts, He was the son of George & Louise Webster. In 1911 they were living at 12 Sixth Ave., Forest Town. Jabez aged 15 was then a Pony Driver Underground at the colliery. Albert Mottishaw was born 1881/2. In 1911 he was living on King Street, off Newgate Lane Mansfield, with his wife Emily and daughter Hilda Hannah. His occupation was a miner. Pte George Edwin Nicholson 8331 RAMC died on the 2nd October 1917, he is remembered on the Tynecot Memorial, Belgium. He was born in 1886 in Shipley, Yorkshire. James William Nicholson brother of George (above) was born in 1888 in Shipley Yorkshire. Nothing is known about George Cox. Does anyone know the names of the other men? Jim (James) Lee was my grandfather’s brother. My grandfather John Ewert and Jim were two of eleven children. Early on they lived in Whaley Thorns. One brother dead in a fire at Landwith Colliery, I think that was Joseph. Tony and I believe that soldier #4 is George Harrison, brother of #2 William Harrison, our grandfather. My brother Alan and I have concluded that William and George Harrison are 2nd and 4th respectively from left on back row. Both arrived Aldershot in August 1914. Grandad William spent his war in Aldershot, while his brother George became a corporal in 1915, and was shipped to Salonika in July 1917, returning in 1919. 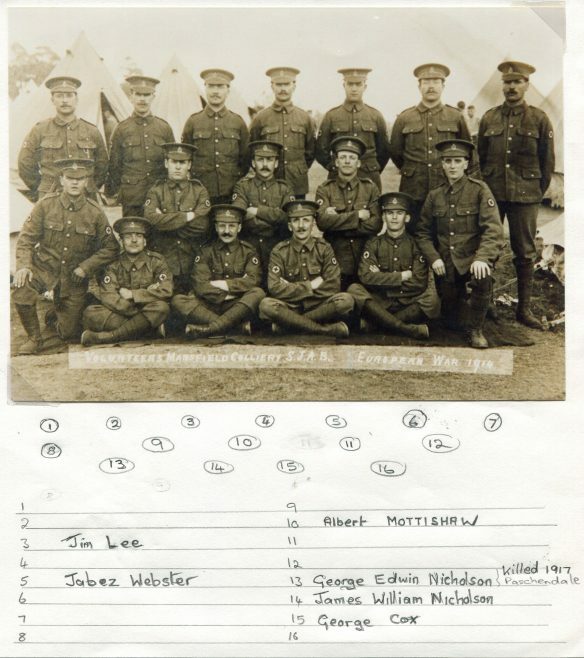 Chad report 13/08/1914: Mansfield Colliery St John’s Ambulance Brigade. 20 ambulance men left Sunday morning from Forest Town to Normanton Barracks , Derby. There were 9 married men and 11 single men. There was a pipe band send off and they were given cigaretts and tobacco by colliery manager, Mr W H Carter, under manager Mr A Davis and secretary to Ambulance Brigade Mr W E Tomlinson. Men who went : James Booth (sergeant) G Nicholson (corporal) James Lee, William Wakefield, Reginald Davis, Walter Newbury, Denis Moxon, John Thomas Perry, Jabez Webster, Edmund Stones, George Chapman, William Marklew, W Nicholson, George Cox, Albert Mottishaw, George Harrison, William Harrison, Arthur Spencer, Henry Ellis and George Bainbridge. Although I can not put names to faces it is likely that some of the above named are the other men in the photograph. It could be that the photo was taken in the early days of the war at Normanby Barracks. My brother Tony and I think that #2 in the photo is William Harrison, our maternal grandfather. He worked at Crownie, was in the SJAB there and volunteered in 1914. He spent the entire war as a cook at the Aldershot Barracks. He lived on Gordon Ave. and later moved to Little Barn Lane. After 1918 he continued to volunteer with the SJAB and the Boys Brigade of Forest Town. I think no 2 on the photo is my maternal grandfather William Harrison who worked at Mansfield Colliery, was SJAB thro and thro, and served in RAMC. We believe he enlisted August 1914 and spent the whole war in hospital camps in England. Cannot read the date on the photo but I have a photo of him in uniform with 2 stripes in 1916 when home on leave if someone wants to try to verify it. My brother remembers my paternal granddad, Lewis Mellors who served with Sherwood Foresters in France saying that RAMC stood for Robbed All My Comradres….both returned to Mansfield Colliery until retirement. I believe the camp at Forest Town during the first World War was a tented camp, could the picture have been taken at the Forest Town Camp before their embarkation to I presume Belgium. I always admire the men who did their bit for King and Country. For many it was their all.